I can’t believe it’s been a week since the winners of the Scottish Book Trust New Writers Awards for 2015 were announced. Moreso, I still can’t believe that one of the winners was me! It’s really so, so incredible to have my writing affirmed like this, and I’m looking forward to the mentorship and the writing retreat immensely, as I think they will really push me to focus and improve my writing and technique. The prize is for writers who do not yet have a collection of poetry published (or a published novel, for fiction writers). You also cannot currently be a full-time student to receive the award. I had to wait until after I finished my Masters to start applying, and honestly, I’ve applied every year since. I think for all writers, submitting your work for publication or competition, only to have it rejected, and being rejected year after year can be demoralizing. I never really expected to win it – so I’ve certainly learned that sticking with it pays off! Keep at it! What’s for you won’t go by you! The application process was very straightforward. It included contact details, a personal statement about how I would benefit from the award and a list of writing achievements (courses, publications, etc). I also submitted a sample of poems (10 pages max). And then I waited! I don’t think I could have been any more surprised when I got the call with the amazing news! My Poem in the Times on Sunday! 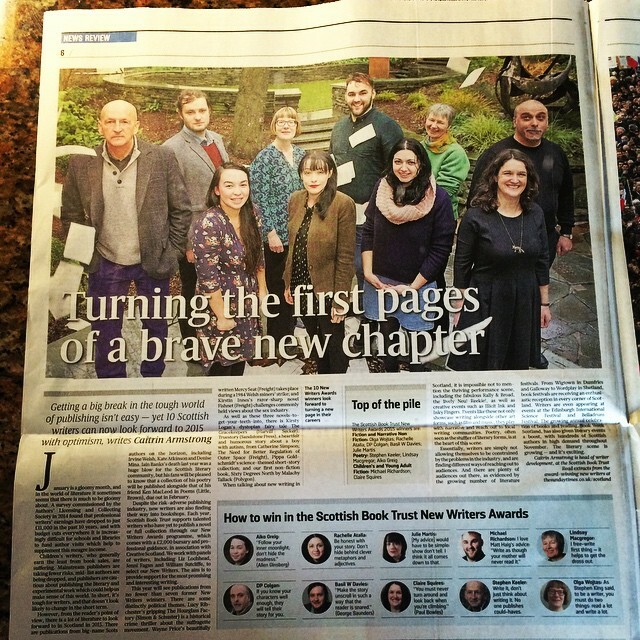 I was elated to have my poem, The Bean, (one of the poems I’d submitted in application for the award) published in the Times on Sunday online last week and to see the news about the award (and our lovely group photo!) included in the print edition. I was also elated that my writing sample was posted *above the paywall*, so anyone can read it! Very exciting! It pays to be an ‘A’? The Times online posted the poem with a photo of Narcissus staring at his reflection, a link to the first line of the poem. But I thought it might be worthwhile to give a bit of context on what inspired the poem. I wrote the poem after Anish Kapoor’s Cloud Gate sculpture, that sits in Millenium Park in Chicago. It’s a huge mirrored bean-shaped sculpture that reflects the city skyline. Do check out the link to Anish Kapoor’s Cloud Gate page which has loads of amazing videos of The Bean (as locals call it): some time lapse, some of the inside (omphalos! the belly button! ), and many showing you the myriad people taking their photos in the reflection and touching the surface of the sculpture. You can also read more at Artsy’s Anish Kapoor page. I’m also so, so grateful for all the kind words from my friends, family and colleagues! and loads of other literary events! Thanks again for all your kind words! I am so excited!